The Third Winter School of Journalism and Communication, dedicated to the World Radio Day 2016 theme "Radio in Times of Emergency", took place from 5 to 7 February 2016 in the foothills of Alatau mountains, in the Tau-Turan educational complex. During the opening ceremony the official video message of Ms Irina Bokova, UNESCO Director-General was presented. More than 100 journalism students, media professionals, community media reporters and public figures from Kazakhstan, Kyrgyzstan, and Tajikistan participated in the three-day debates, workshops, trainings and group games. School of Journalism has been organized by Mediasphere Centre for Humanitarian Studies of al-Farabi Kazak National University with the support of UNESCO Almaty Cluster Office, the United Nations Information Office in the Republic of Kazakhstan, United Nations Office for the Coordination of Humanitarian Affairs, Caucuses, Central Asia and Ukraine (OCHA ROCCA), Kazmedia Center Company, Kazcontent company, Kazakh Club of Chief-Editors, Kazakh University Publishing House and Turan University. 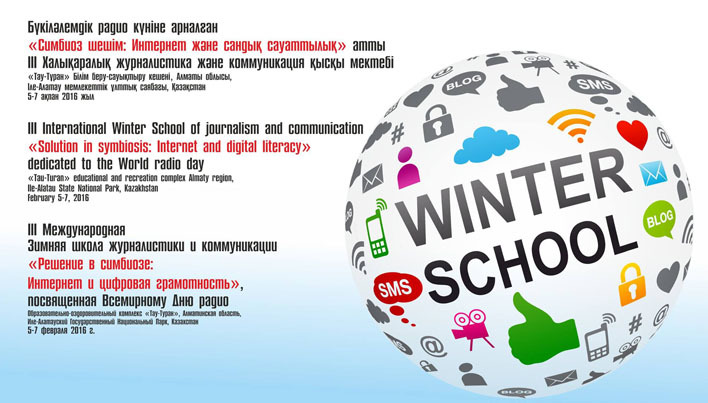 Winter School contributes to the Media and Information Literacy themes by presenting 3 modules: Information and media; New and traditional media and Internet literacy; and to the mission and activities of the United Nations Academic Impact (UNAI) Global Hub on Sustainability hosted by the al-Farabi Kazakh National University. "MIL played crucial role, helping people to understand mass media messages about sustainable development", said Mr Andrei Chevelev, O.I.C Director, UNESCO Almaty. Winter School contributes to International Decade for the Rapprochement of Cultures 2013-2022, and to the follow up of the UNESCO Fight Radicalization and Extremism in Internet Conference in Paris, 2015. MIL played crucial role, helping people to understand mass media messages about sustainable development"
New mobile application Voices of Kyzylorda was launched during the opening ceremony. This event is reflected in the UNESCO World Radio Day global map.